...The more that I read and hear, the more that I find myself wondering if the staunch opposition to the United Arab Emirates taking over American ports is really one of security concerns, or simply one that has come about because George W. Bush wasn’t opposed to it. In turn, I find myself wondering if my own initial opposition to Dubai Ports World acquiring the ports from the previous British owner is merited. ...First we saw a change in stance by people who were previously opposed to profiling and stereotyping based on skin color or nationality. It used to be that they hated to see broad generalizations of foreigners by police and security officials. Now, those very people are more than happy to suggest that the UAE are nothing but terrorists because they’re Arabic. ...The second change in stance was from the folks who work the ports, namely the Teamsters and their affiliate, the International Longshoreman’s Association. In 2002, the ILA wasn’t too keen on the possibility of losing workers at ports after a law was passed that would require criminal background checks for longshoremen and other dockworkers. At the time, officials at the ILA estimated that up to 300 of 2,000 union longshoremen were on the verge of losing their job because of the background checks. By 2003, not a single worker had a background check done due to delays caused by lawsuits. At the time, an AFL-CIO official said that if someone paid for his crime, he should have the chance to show that he’s trustworthy. ...Fast-forward to a few days ago when we saw photos of Teamsters protesting the UAE port deal under the guise of safety and security (see the photograph above). There seems to be one of three possible occurrences here: 1.) 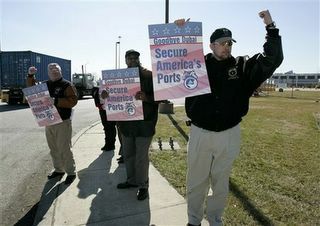 The Teamsters have had a change of heart and are now gung-ho about port security; 2.) They figure that potentially criminal Middle Easterners are worse than potentially criminal Americans; or 3.) They oppose the UAE deal because Bush didn’t oppose it, and they—along with many of us—don’t like Bush. ...That brings me to the conclusion that seems to be prevalent in this issue and the reason that I’ve found myself re-evaluating my previous opposition to the deal. Have many of the critics of the UAE deal taken their stance only because it’s the opposing stance to Bush? I didn’t vote for Bush in either 2000 or 2004, but I’ve never allowed myself to oppose something just because he supported it. Likewise, I’ve never supported something simply because he opposed it. ...We’re no better than the people whom we dislike if we oppose something just because the given issue has their support.